Prop Ryan Grant has emerged as key part of Scotland's armoury since making his Test bow in their historic win against the Wallabies in Australia in 2012. The powerful loose-head began his career in 2005 with the now defunct Border Reivers and quickly established himself as one of the most promising young forwards in the Scottish game. He made his first appearance for the Scotland Under-21s in the 2006 Six Nations clash with France and retained his place in the front for the remainder of the Championship. 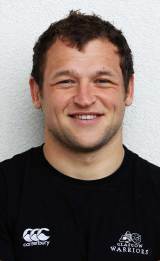 Grant was snapped up by Edinburgh the following year, shortly after making his first appearance for Scotland A, but was forced to wait until February 2009 to make his debut for the club. Frustrated by a lack of game time, Grant moved on to Glasgow during the summer of 2010. The switch paid off, with Grant's impressive form for the Warriors earning him a place in Scotland's provisional 40-strong squad for the World Cup in New Zealand. Grant pushed on in the 2011-12 season and was rewarded with his first Scotland cap against Australia on the summer tour of the southern hemisphere.